The Barrel Fish is a relatively large deep-water fish, at 35-inches in length and 25 pounds when fully grown. The majority of the species are found in the waters of South Carolina, near the rocky bottom known as the Charleston Bump. Today, the species can be found in Key West in deep waters. Our 42-foot custom Stapleton Sportfish is equipped with the technology and power to make the trip promptly. At Captain Moe’s Lucky Fleet, we offer the best fishing experience in the state, which means finding the fish you’re in search of when possible. Did you know the Barrel Fish has never actually been witnessed underwater before, at least as an adult? Most fishermen are surprised to learn this little tidbit, but it is entirely accurate. The young of the species have been photographed or captured underwater, but the adult is quite elusive and has only been photographed after having been caught by commercial fishermen. 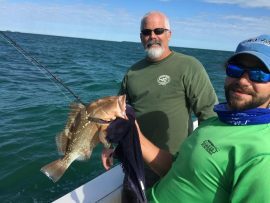 Fishing in waters 600 feet or deeper is not the same experience as simply dropping a bit of bait over the side in a shallow reef and hoping for a grouper. That is an easy task. Experienced fishermen know that deep drop fishing is the only surefire method to snag a Barrel Fish on a charter. You must be prepared when seeking fish that thrive in complete darkness and cold water. Those fish can be difficult. Reeling up the line to change bait can easily take 25 minutes, which is why many anglers use electric reels. To capture a barrel fish, though, deep dropping is the only way to go. If you’re interested in deep-sea fishing and looking to snag a Barrel Fish for your bucket list, contact Captain Moe’s Lucky Fleet to schedule a charter. You can give us a call at 305-304-8065.